Take 1 tablet 20 to 30 minutes prior to bedtime or as directed by your qualified healthcare professional. WARNING: Do not drive or operate machinery immediately following use of this product. Take for maximum 13 weeks and then have a break to prevent the inhibition of natural production of this hormone. If you have no problems with falling asleep, but you wake up often at night, take 1 capsule just after waking up. It helps you sleep peacefully the whole night. Taking higher doses may cause hypersomnia and problems with waking up. Encapsulated folate of the 4th generation – Quatrefolic®. Reduces the risk of hyperhomocysteinemia. Magnesium, potassium and vitamin B6. It prevents contractions, helps the nervous and cardiovascular systems. 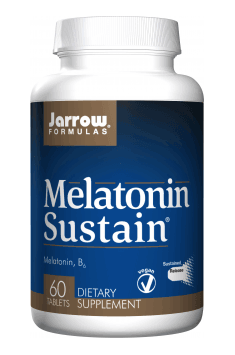 Melatonin - resulting in the largest quantities in the pineal gland pinealocytes - indoleamine, naturally synthesized using N-acetylserotonin created previously with serotonin. Its characteristics manifested by interacting with melatonin receptors MT1, MT2 and MT3 and nuclear receptors. Affecting the operation of the biological clock, it regulates the processes occurring both in the diurnal, and long-term cycle, e.g. annually. It gives the body a signal to sleep. In preparing for the night's rest, system reduces the temperature of the body, lowers blood pressure, slows digestion and adjusts the rate of biochemical changes. Improves mood and attitude to life after a good night's sleep. It has a significant impact on the discharge of hormones of the hypothalamus, pituitary and gonads, particularly follicle stimulating hormone (FSH) and luteinizing (LH), this is reflected in the normalization of reproductive performance. By reducing the expression of ERa, inhibiting the association of estradiol ER-ERE for DNA, and reducing aromatase activity, shows an anti-estrogen action Optimizing growth hormone and cortisol levels, improves night renewal system, the growth of the desired structures and burning of excessive body fat.